Angel Colon’s memory of what happened on Sept. 20, 2017 is still fresh in his mind. Standing on the rooftop of a one-story community building, he describes what happened to a nearby basketball court. “The hurricane moved the metal roof from there, lifted it in the air and threw it to the corner all rolled up as if it was a cake,” said Colon, as a temporary blue roof, stamped FEMA, now serves as a replacement. Hurricane Maria’s impact on Puerto Rico reinforced something he already knew — in times of trouble, communities comes together. “This became a destination of where people would come and look for assistance,” said Colon, the head of the Social and Cultural Development Committee in the town of Daguao. The total collapse of telecommunications on the island, and its near complete isolation, drove a community of 2,200 closer. “The community is what saved lives here. Individual differences didn’t matter because if they didn’t help each other, they wouldn’t be alive,” said Maria Lopez, the secretary of the organization. Solar panels atop a community organization building in Daguao, Puerto Rico. This grassroots group, active in the Daguao barrio of Naguabo since 1987, used the hurricane to innovate. 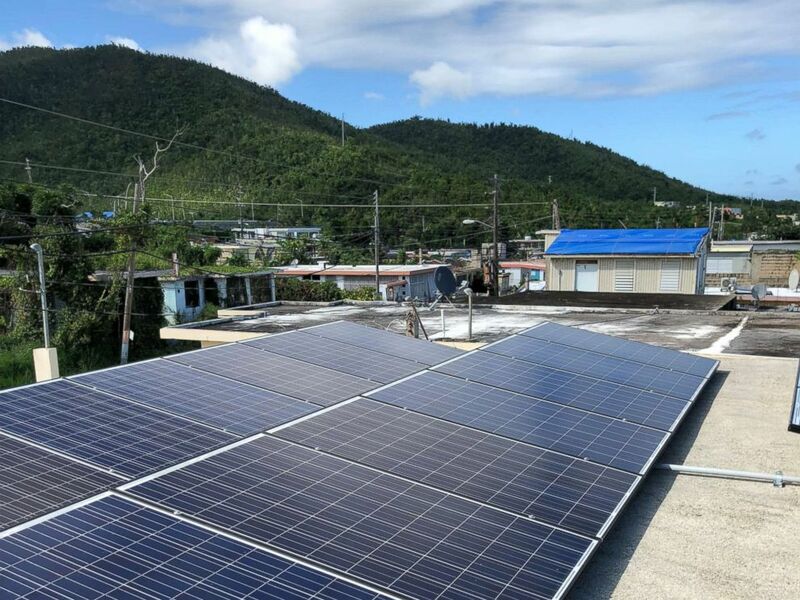 They were partnered with Resilient Power Puerto Rico, an organization that is bringing solar panels to community centers throughout the island. “We decided, let’s take the path of Maria and Irma … and say we are going to focus on the hurricane paths because those are most likely the most impacted communities,” said Jose Terrasa-Soler, the secretary of the organization. Headquartered in San Juan, Resilient Power Puerto Rico is modeled after a group that supported the Rockaways community in Queens, New York, after Superstorm Sandy in 2012. 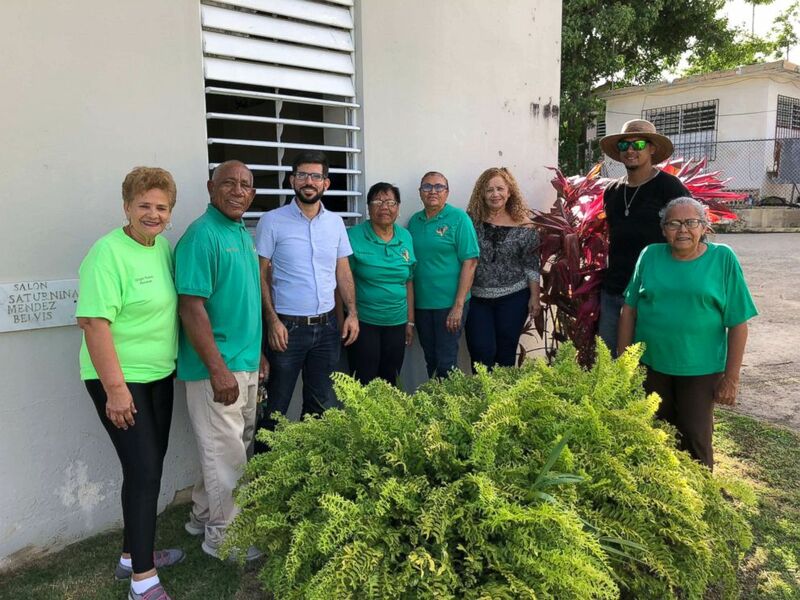 Members of the Social and Cultural Development Committee of Daguao stand alongside a member of the Resilient Power Puerto Rico team. 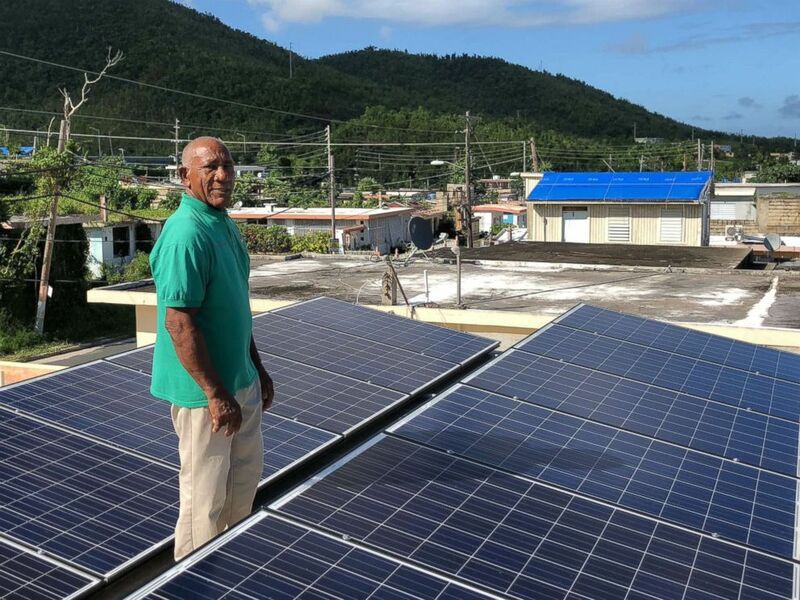 Community leader Angel Colon with the solar panels atop a building in Daguao, Puerto Rico. The Puerto Rican organization raises money from private donors and organizations to buy discounted and overstocked solar panels and install them at community centers at no cost to the local entities. There are currently 50 planned projects throughout the island. The Puerto Rico Electric Power Authority reports that 99.1 percent of the island is back on the electrical grid, leaving over 13,000 customers still without power. In an interview with ABC News in March, Gov. Ricardo Rossello said the entire island would have power before the start of the Atlantic hurricane season on June 1. “We are eight months after the hurricane and there are still communities in the mountains that don’t have power,” Terrasa-Soler said. 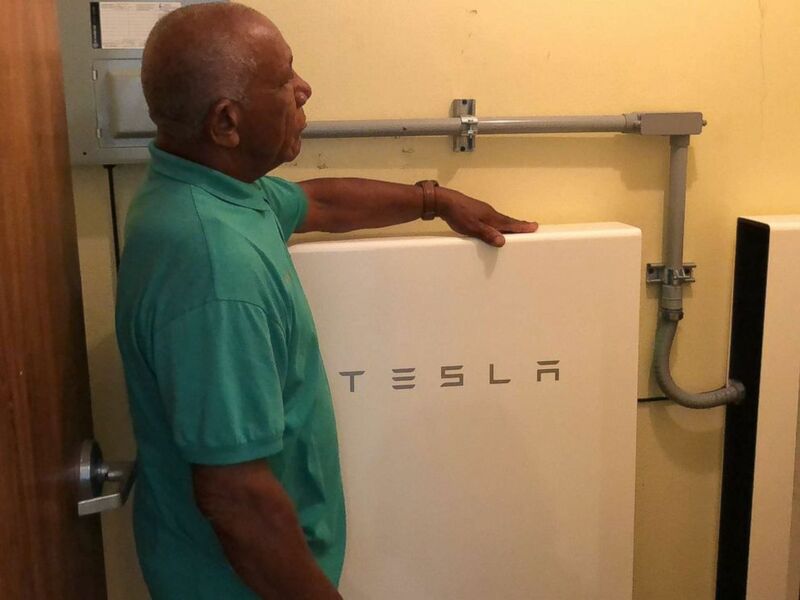 Community leader Angel Colon next to a TESLA Powerwall battery, which stores solar energy. The power collected by the 14 donated solar panels atop a multi-purpose room is stored in two rechargeable lithium-ion TESLA Powerwall batteries that allows for a small microgrid. The cost of the microgrid at the location is $25,000. Daguao got back on the electrical grid in March, having lost it when Hurricane Irma passed near the island before Hurricane Maria. The local kindergarten to eighth grade school got back on the electrical grid on Tuesday, days before the start of hurricane season. 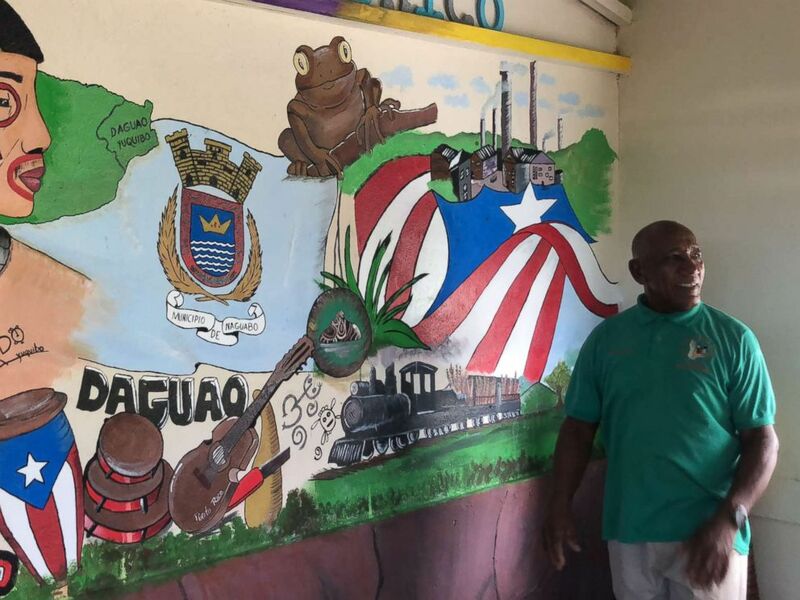 Community leader Angel Colon poses next a mural dedicated to the town of Daguao. Community organizers will be using the space as a future distribution point of supplies after the next natural disaster –- all thanks to the renewable energy.